The way rewards work in MTG:Arena is twofold – daily and weekly. The daily is a pretty easy to hit challenge by just playing the specified card colors, and the weekly grants you a pack of cards at 5, 10, and 15 wins. What is good about this in the early stage of the game (you can’t spend money yet) is that that 15 wins stays up all week – so it acts like a counter of sorts for how many wins you got for the week. I did over 40 wins last week and am quickly figuring things out. In this early stage there are no statistics (which would be interesting) and matchmaking at this early stage is clearly more interested in getting you playing quickly than evenly. I don’t even know if they are matchmaking by level at this point. It doesn’t matter because one thing I am learning quickly is that there are so many variables to a successful match that is out of your control – but enough that is IN your control – that you can clearly tell this game has been played and tested for years. However that doesn’t seem to set the learning curve. Sometimes you just have to fail and fail hard, and then head to google for the answers. I think that is the new, life metaphor we all live by. Yes that was mostly tongue in cheek. As a noobie I tried a bunch of preset, 60 card decks. They seemed to all be interesting and have their own nuances, but I wasn’t getting better by swapping decks so quickly. I needed to grab a deck and focus on it and become good at it. The answer came to me in the form of a pack of cards. 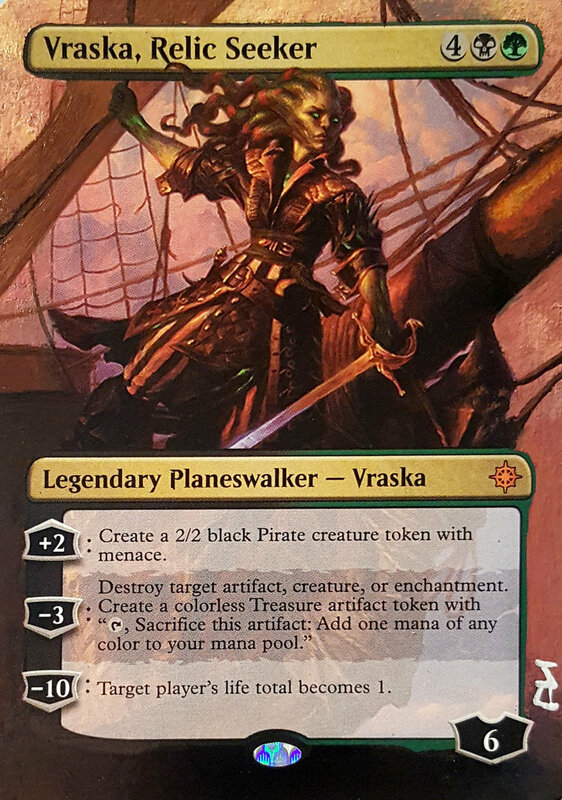 I drew a legendary Pathfinder – Vraska, Relic Seeker. Pathfinders are high(er) cost cards with a health pool based abilities. One that adds to the health, and two that take away from it. They can be directly attacked by creatures and spells in the game as well. Love of my life! A little tentaclely, but I am not superficial. The + health card gets you a nice 2/2 Pirate that needs to blocked by 2 or more. The small, -3 health ability – destroy target artifact, creature, or enchantment is an amazing controlling benefit and the -10 power really changes the state of the game. Armed with my new girlfriend I had to pick a deck that she would fit in. Some comfortable digs. The base deck – The Golgari Exploration (which is a swamp/forest based deck, the same two land cards you need to play Vraska) had to be it. So it was. 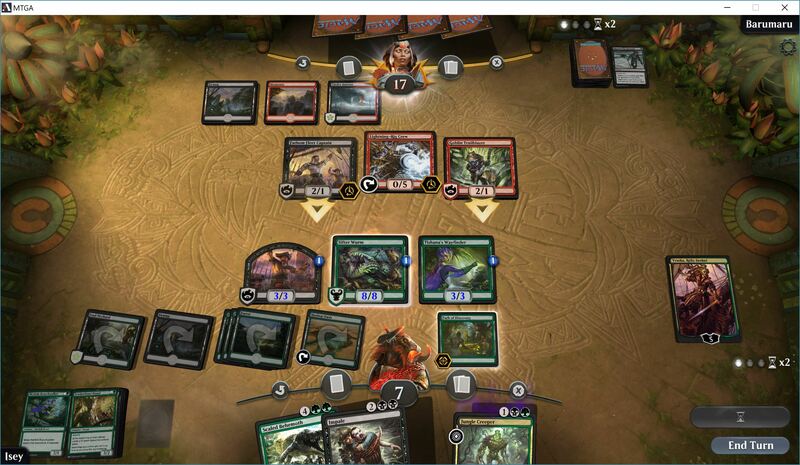 It’s a fun deck based on cards and enchantments the have the “Explore” feature. Which allows you to find and play more land cards. From what I have learned it also has a good amount of control cards (clearing out enemy creatures) but I quickly found decks I was weak against. And this is how I started getting better at the game. A very popular deck I see a lot is a “blue” deck – which has a lot of counter creature and counter spell cards. Frustrating when every time you try and play one of your cards the other player negates it. When you finally get your Pathfinder on the board only to have it negated by a 2 power card it feels like the tables turn. I needed a way to counter that. 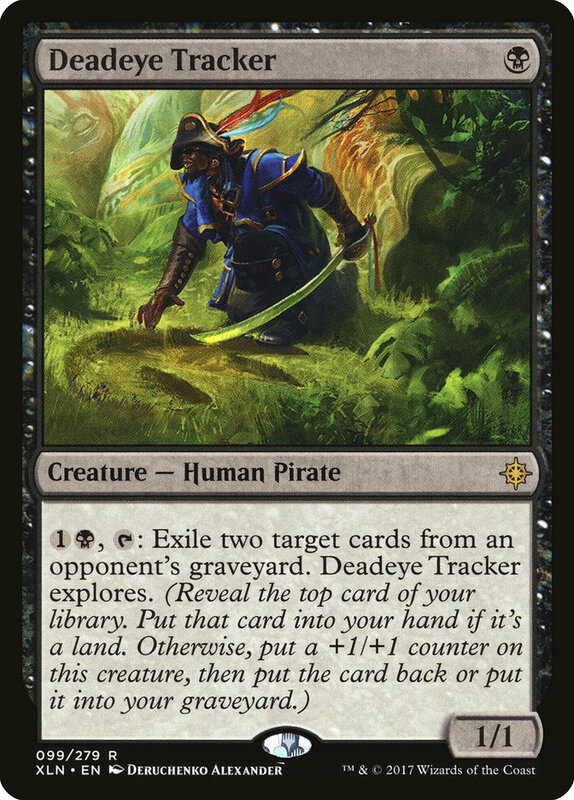 I found my own, two power card that allows you to retrieve a card from your graveyard (where dead creatures go) so I placed a couple of them in my deck – and have been able to use them successfully. The trouble there is that they have all sorts of “remove / negate” creature cards so I needed a way to look at my opponents deck before bringing a card back. I found one and placed a couple in my deck. Those cards have helped me compete against blue decks – even though I am still very much at the mercy of which of my (and my opponents) 60-70 cards are drawn at any time it is far more fun knowing you have counters to your counters in case it happens. So now I could deal with those pesky “blue” (island) based decks. 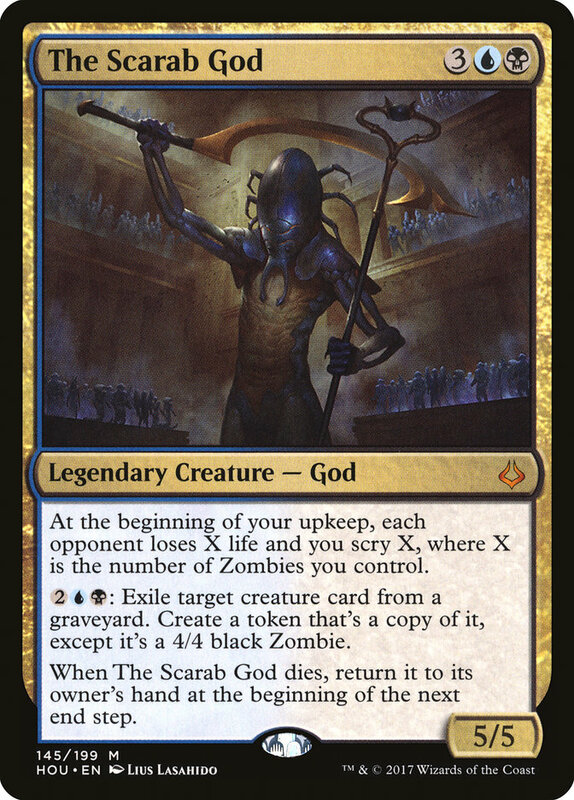 Then I kept running into issues with a card called The Scarab God. It was literally a “game over” card for me every time I played against it. It’s a strong 5/5 card that can grab any card from your (or your opponents) graveyard and make a 4/4 zombie of it. Terrifying when you face him, and when you kill him, he has the pesky effect of going right back into your opponents hand next turn. Like a cockroach, you can never really get rid of him. Or can you? Magic has 2 discard piles. One, the graveyard, cards can be pulled back from with various cards. 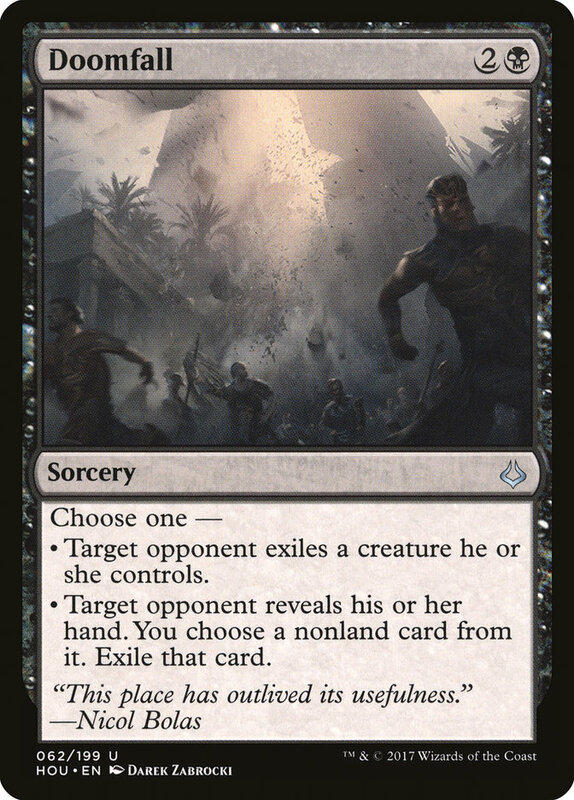 The other, is the “exile” pile – when a card goes to exile it is gone from the game. So how do I kill the Scarab God, and exile him, all in one turn? Is that possible? Yes it is! And thankfully there are great in game (and on web) resources to find cards to help you with your issues. Enter the low cost, Deadeye Tracker. There. Now I can kill and exile that card all in one. Building up defenses so at least I know I have the right cards to counter him if I face him. Keep in mind that any card I add has to be a swamp or forest cost card or I can’t play it. 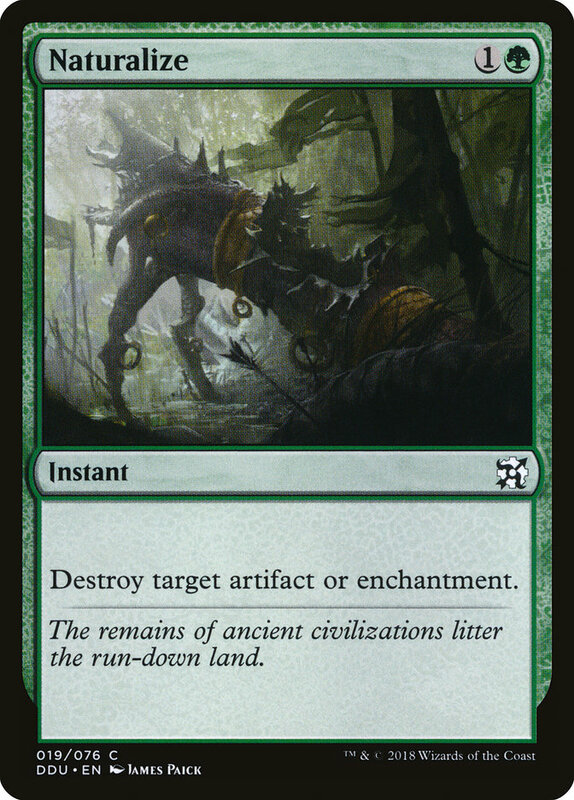 In MTG you CAN add more land based cards (tri color decks, etc.) but due to how many cards most people carry that’s a high risk on a card draw. So while I chose the above cards to deal with my issues based on the land cards my deck is based off of there are other cards for other lands (and even other cards for my lands). I tried to find ones that work with my style of deck – and the above card also “explores” on that use – and I have several cards that gain benefits / interact with the explore mechanic. My last big challenge was enchantments. Often I’d get a strong hand and my opponent would play an enchantment card that would remove my card / creature from play until the enchantment was dealt with. The base Golgari Exploration deck has zero counters for this. I had one on my Pathfinder, but that is a high cost card AND often when I played my Pathfinder that was the card my opponent would enchant. Enter another easy and low cost counter. And with that card I now have a deck I feel comfortable with countering anything that I have played against so far. This doesn’t mean I win every game of course, but it means there are far less “lose for sure” scenarios. I have the tools to counter my opponents. Each game I learn new ways and face better opponents. I am loving that losing is just another experience for me to consider how or what I could have done differently. And if the answer was “nothing”, then I can search for ways I don’t already know to help myself out in the future. That part has been almost as fun as playing the cards to begin with. As a note – I do have an extra code if you are interested in joining in the closed beta. There is zero monetization in the game currently so it’s for fun and testing. My Blog helped me get through a dark part of my life, then became a part of my life, and eventually I realized it wasn’t something I needed anymore, so I wrote that final post. I was talking with a coworker the other day and it sounds cliche but I told him if we spend our life chasing happiness, we’ll never “catch” it and we’ll never be happy; we have to learn to find happiness in being where we are. I’m finally happy with where I am, and I hope you are, too. CAP’N! Great to hear from you! Every time I tried to click on your blog it said permission denied. =) I was excited with the prospect that you were still going, and just made it more private in nature. I remember our discussions back in the day, gaming and life, when you, Tesh and I were all very active. Part of the WRIP, for me, is just making sure the writers on those sites are OK. When people fade off in the interwebs I can’t help but wonder and hope that everything is OK, and they are off doing “better things”. It’s weird when your only connection with someone is online, and that goes away, you never really know what happened to them. Glad you are well and your blog served it’s purpose. Even happier that you are in an amazing place now and enjoying life. Things are good here. You can tell I post less when having fun in life and gaming too, and you just inspired a blog post in me.. in some of my hardest times I turned to blogging more. Comfort? Who knows. I’ll explore further. Very happy to hear from you. If I don’t again, enjoy the journey! It was a pleasure being a small part of yours.